U.S. Exports to China are growing faster than U.S. exports to other nations. U.S. goods and services trade with China totaled $539 billion in 2011. 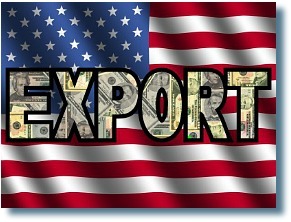 Exports totaled $129 billion; Imports totaled $411 billion. The U.S. goods and services trade deficit with China was $282 billion in 2011. China is currently our 3rd largest goods trading partner with $503 billion in total (two ways) goods trade during 2011. Goods exports totaled $104 billion; Goods imports totaled $399 billion. The U.S. goods trade deficit with China was $295 billion in 2011. Trade in services with China (exports and imports) totaled $36 billion in 2011 (preliminary data). Services exports were $25 billion; Services imports were $11 billion. The U.S. services trade surplus with China was $13 billion in 2011. China was the United States 3rd largest goods export market in 2011. U.S. goods exports to China in 2011 were $103.9 billion, up 13.1% ($12.0 billion) from 2010, and up 539% from 2000. It is up 442% since 2001 (when China entered the WTO). U.S. exports to China accounted for 7.0% of overall U.S. exports in 2011. The top export categories (2-digit HS) in 2011 were: Machinery ($12.2 billion), Miscellaneous Grain, Seed, Fruit (soybeans) ($10.7 billion), Electrical Machinery ($10.1 billion), Vehicles ($6.8 billion), and Aircraft ($6.4 billion). U.S. exports of agricultural products to China totaled $18.9 billion in 2011, the 2nd largest U.S. Ag export market. Leading categories include: soybeans ($10.5 billion), cotton ($2.6 billion), hides and skins ($1.2 billion), and coarse grains ($843 million). U.S. exports of private commercial services* (i.e., excluding military and government) to China were $24.7 billion in 2011, (preliminary data), 17% ($3.6 billion) more than 2010 and 393% greater than 2000. It is up 357% since 2001. Other private services (business, professional and technical services and education services), travel, and the royalties and license fees categories accounted for most of U.S. services exports to China.exports,respectively. According to ITA (International Trade Administration ), A total of 30,050 U.S. firms are known to have exported merchandise to China in 2009 - the last year for which data are available. The 2009 total of exporting firms is more than seven times the number in 1992, when 4,092 firms exported to China. The number of known small and medium-sized enterprises (SMEs) that exported to China in 2009 totaled 27,518- up from 3,143 SMEs in 1992. Ninety-two percent of all U.S. exporters to China in 2009 were SMEs. This is up from 1992, when 77 percent of exporters to the China market were SMEs. The number of SMEs exporting to China has been rising much faster than the number of large companies. From 1992 to 2009 the number of SMEs exporting to China surged by 776 percent, compared to 167 percent for large-company exporters.